Navratri tattoo designs are call of time as Navratri 2018 is just about the corner. All that we wanted is to update our readers with the latest trends in Navratri with latest Navratri Tattoo images to latest Chaniya Choli patterns for Navratri. October 13, 2018 is when the ultimate festival of Garba; Navratri begins. This is one festival that is utterly loved by the children and mostly youth. It is one of the best times of the year to meet new people, dance with them to the latest and classic Garba tunes. Often people join classes to learn and excel in the latest Garba steps, even before the monsoon arrives. Their months of training and non-stop hourly practices really works magic and such an incredible aura it creates among the crowd. This is the time when women are found to look their best during all the evenings of Navratri, to outperform even the best of the bests. 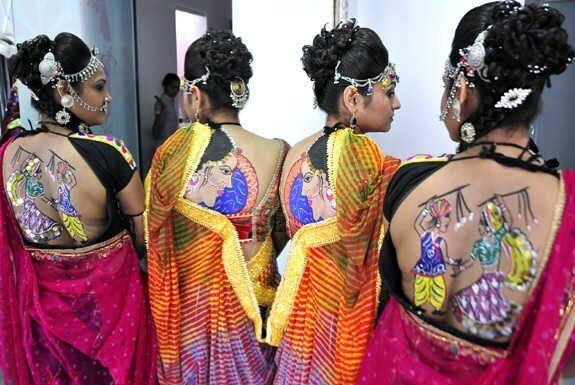 And getting tattoos especially for Garba nights is highly popular. This trend is slowly catching up among the men too. This is perhaps an ultra modern fashion blended with traditional swirling attires and topped with some really daring fashionable temporary tattoos. 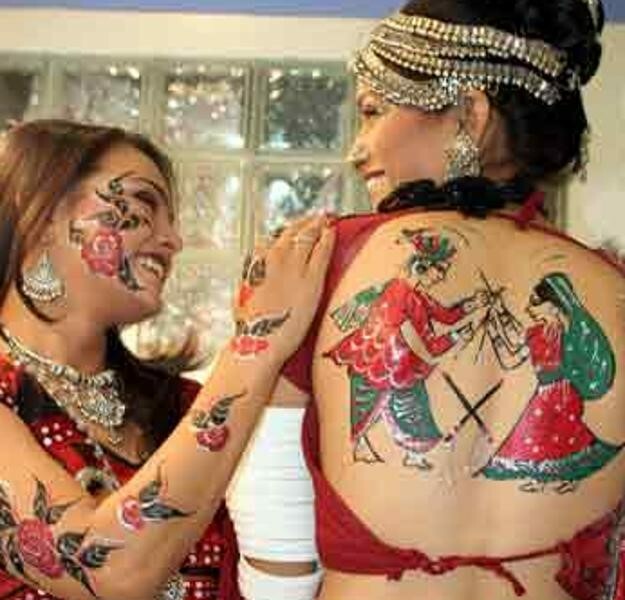 In Gujarat, since ancestral times, tattoos were prevalent, but designs were quite traditional. Traditional tattoo designs in Gujarat were called as Chhundna and you can still spot it on faces of aged ladies of Kathiyawad and small tattoos, which are not that prominent in old ladies staying in cities. Such tattoos are made from skin-friendly Chinese dyes to form the tattoo base that can last for about a week. And gradually, it is to be filled with in with poster colors daily or even acrylic colors for longer lasting than water colors. And thus, the tattoo experts have already been booked in advanced for these 10 phenomenal days, where you will be surrounded by the beauties dancing and enjoying to the fullest. Garba is also highly popular among the fitness enthusiasts as it involves a very intense training with nonstop garba daily for an hour or two. Majority of women, who are skeptic to go for any gym or fitness center, would zero on Garba classes, because it is easier to dance when you have many friends together to enjoy that very moment. Gujaratis call playing Garba as Garbo Levo and taking a round of Garba is considered auspicious in Gujarati traditions. Every festival may it Ganpati Visarjan or Ganpati Chauth (arrival of Ganpati) or Janmastmi or marriage in family, women atleast perform a small round of Garba to mark the austerity. And therefore, this is one festival when you would almost find every single woman adorned with beautiful Garba attires, tattoos, make-up. One of the most popular tattoo designs for Navratri is of couples posing with Dandiyas or playing garbas. And some even flaunt their belly buttons by painting their love handles so beautifully with such splendid tattoos. Now that’s something bold for a style statement. 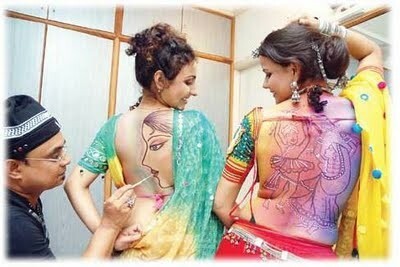 Some women prefer to get painted a single lady playing with a dandiya. It looks so majestic. Even the tattoos of deities are in much demand these days. Some even opt to get peacock, star, portrait of a woman’s face from side, et al. The charges for such tattoos vary from Rs. 100 to Rs. 1,000 depending upon the design and use of colors. Navratri Tattoo designs for full arm is famous among guys. Mostly it is backless cholis that justifies the looks of a tattoo, while some may even adapt to wear short cholis with a transparent or no dupatta to reveal the tattoo around the navel. And so, you have endless options to sport a tattoo just anywhere such as on the spine, cheek-side, back of your neck, the entire back or just the upper arm, whichever you wish for and goes according to your dress. Don’t forget to add a bit of sparkle or florescent color to dazzle in the night. Do remember to share your pictures of this Navratri with us on our Facebook Page. We would love to view them with our patrons. And also don’t forget to share your tattoo experience, if it were for a first time or Nth time. After all, when tattoos can be so economical in the most demanded season, why not get it at least once.